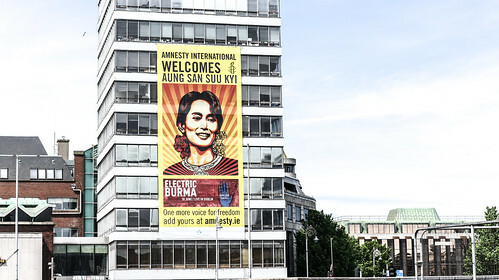 Aung San Suu Kyi - Visits Dublin, originally uploaded by infomatique. Aung San Suu Kyi MP AC is a Burmese opposition politician and General Secretary of the National League for Democracy (NLD) in Burma. In the 1990 general election, the NLD won 59% of the national votes and 81% (392 of 485) of the seats in Parliament. She had, however, already been detained under house arrest before the elections. She remained under house arrest in Burma for almost 15 of the 21 years from 20 July 1989 until her most recent release on 13 November 2010, becoming one of the world's most prominent (now former) political prisoners. Suu Kyi received the Rafto Prize and the Sakharov Prize for Freedom of Thought in 1990 and the Nobel Peace Prize in 1991. In 1992 she was awarded the Jawaharlal Nehru Award for International Understanding by the government of India and the International Simón Bolívar Prize from the government of Venezuela. In 2007, the Government of Canada made her an honorary citizen of that country; at the time, she was one of only four people ever to receive the honor. In 2011, she was awarded the Wallenberg Medal. On 1 April 2012, her opposition party, the National League for Democracy, announced that she was elected to the Pyithu Hluttaw, the lower house of the Burmese parliament, representing the constituency of Kawhmu; her party also won 43 of the 45 vacant seats in the lower house. The election results were confirmed by the official electoral commission the following day. Suu Kyi is the third child and only daughter of Aung San, considered to be the father of modern-day Burma.